Blazblue Wallpaper: Nii - San!! ? Minitokyo »	Blazblue Wallpapers » Blazblue Wallpaper: Nii - San!! ? * Jin Kisaragi: The scan was taken from one pages of the official comic. I had to make up for having his coat because he did not have. 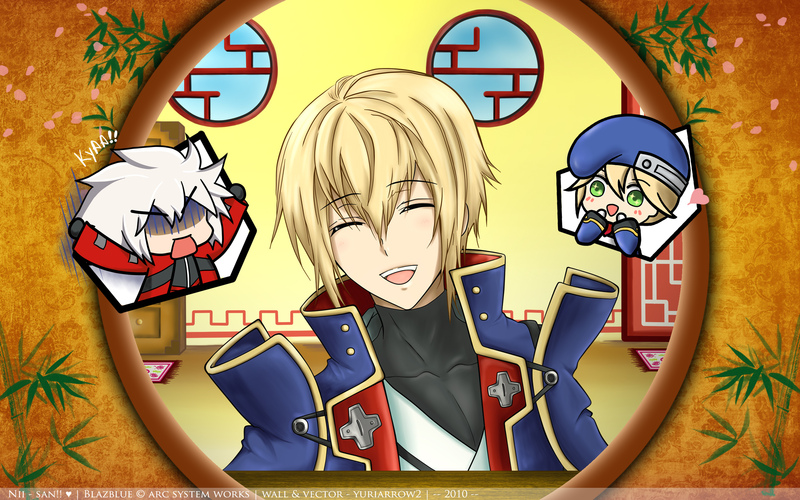 * Chibi Ragna & Noel: They were taken from the screeshot the radio show "Bururaji". * circle background: Inspired by the extra space comes in the game: "teach me, Miss Litchi!" Ragna & Noel: 2 days. This wallpaper looks like a previous job that I made. amazing. Jin is my favorite character. I like how they did the voice acting (japanese) and his twisted personality. Also he is one of the strongest characters 4 me. Hahahahahaha sooo funny! thank you! wow! she is so cute! i like it! thanks for share it! wow! she is so cute! i like it! thanks for share it!..